Welcome and thank you for your interest in supporting Carrollton. From the founding of the Society of the Sacred Heart, St. Madeleine Sophie Barat relied on the generosity, graciousness and support of people who shared her conviction that an education rooted in faith and intellectual life is of essential value. Founded in 1961, Carrollton has relied on the generous support of our parents, alumnae, faculty, staff, board of trustees and friends to support the school programs not covered by tuition income. 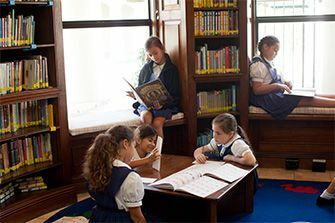 Sacred Heart education is unique in its development of the child as a whole with concern for each student's spiritual, intellectual, emotional and physical growth. The mission of Institutional Advancement is to support and further Carrollton's Sacred Heart mission, set forth in the Goals and Criteria of Sacred Heart Schools. This is accomplished through various advancement and fundraising initiatives throughout the school year which allows individuals to give their time, talent and treasure to Carrollton. We invite you to join the many supporters who have assisted us in our mission to educate courageous, confident, and compassionate women of the Sacred Heart.